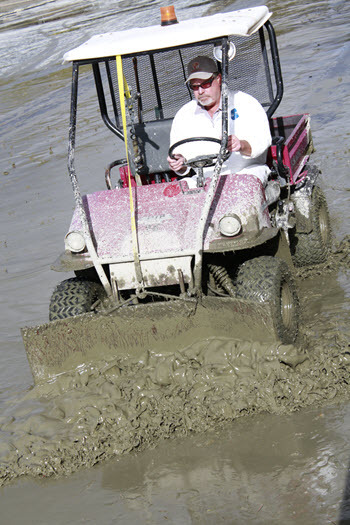 Dennis Salvadori of University Facilities Services Department uses a scraper rig to clear sludge in the Reflecting Pond. California’s El Niño winters never have been a sure thing. Some seasons of oceanic warming produce record rainfall and flooding, while others barely threaten average seasonal precipitation. But at California State University, Stanislaus, annual preparations are being completed as if a deluge was guaranteed. “We have winter preparations every year, but this year we’ve been able to do things above and beyond those,” said Louie Oliveira, chief operating engineer in the University’s Facilities Services department. The most visible project has been the draining and cleaning of the Reflecting Pond which is being done by Hugo Hernandez and his team. Oliveira said the pond hadn’t been dredged in several years prior to 2014, resulting in more than 12 inches of sludge in some areas. Because of that, cleaning has been added to the annual schedule, and this year’s draining revealed only three to four inches of sludge through most of the pond. The biggest weather-related project, completed months ago, should result in something the campus won’t be seeing this year — flooding in and around the Geer Road entrances after moderate showers. And then there’s something you might already have seen on campus — the University’s new street sweeper, which will help the facilities department stay ahead of the never-ending task of keeping gutters and inlets cleared of leaves and debris. Facilities also brought in a commercial drain vacuum to rid the opening of debris ahead of any coming storms. The University’s unique ability to store and reuse water is garnering attention, including a prominent mention in the current edition of Building Operating Management  magazine, a national publication based in Milwaukee. The water retrieval system is so advanced that through the first 10 days of December, when only 0.32 inches of rain fell on campus, as measured by the Turlock Irrigation District, the University was able to retrieve more than a half-million gallons of water.